Impressive off-road trip through one of the most unique regions of the globe, the Route of Emotions – Jeri, Delta, and Lençóis Maranhenses. Fantastic landscapes such as “wilderness” of Brazil, full of crystal clear lakes, the only open sea delta in the Americas and one of the prettiest beaches in the world will be visited on this tour, which includes ecotourism, adventure, sun & beach, culture and cuisine. In this option, The Route of Emotions comprises also part of Ceará and Rio Grande do Norte coasts. Four states of Northeastern Brazil will be visited in modern 4×4 vehicles and speedboats, besides several OPTIONAL activities such as walks, horse rides, panoramic flights, surf, kite and windsurf, bird and natural life watching besides living experience with local communities. 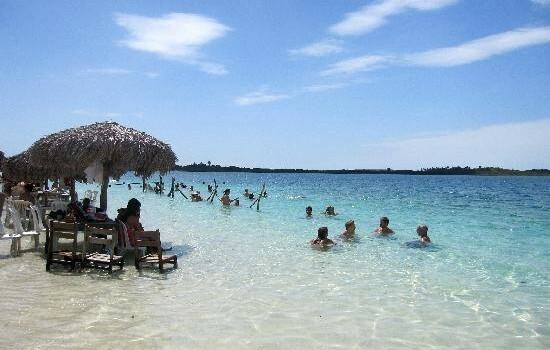 Departure in the morning to the famous Genipabu beach to take pictures, then follow the coast to the Maracajaú beach, known for its parrachos, formation of reefs at 6 km from the coast, a great place to dive. After that stop we will go on by road to the Village of Sao Miguel do Gostoso. Free night. Departure by the beach, passing by dunes and inlets until the village of fishermen Exum Queimado. 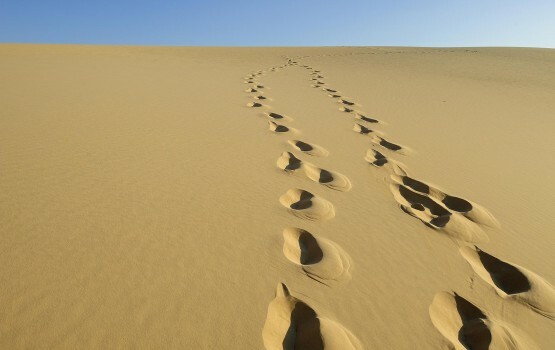 We will pass within the saline, through the dunes of salt, until the pavement where we will continue our whole journey until the little town of Ponta do Mel. We continue by the beach and then by road to reach the port, from which we take a typical boat that will take us to the bucolic Galinhos, where we overnight. After breakfast, return by boat and then by a mixed section of asphalt and by the seaside we will follow to the city of Areia Branca, where we have a ferry crossing. After the crossing we continue by the beach until Canoa Quebrada. Departure in the morning via paved road to the Parajuru beach, where we begin our walk by the beach. 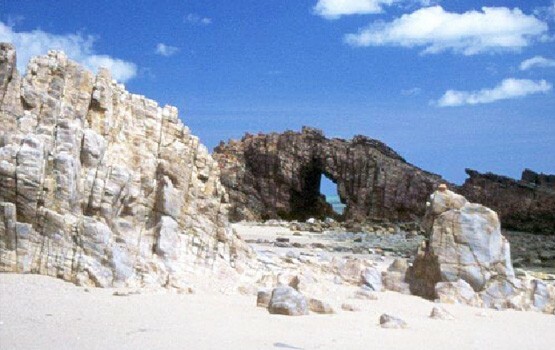 We will have a stop at a beach of Morro Branco to know the colored sand cliffs. After lunch we go on by paved road to Fortaleza. This day travelers choose among three transfer options until Jericoacoara: by road on 4×4 or bus; or by the beaches on 4×4. In the options by road we will drive 370 km until Jericoacoara. In the option by the beaches, we will follow until Icaraí and Cumbuco beaches, yet in the metropolitan region of Fortaleza. We will also discover the beautiful Lagoinha beach, Ceará’s postcard, and we will visit the mouth of the Trairi River, which we will cross on the ferry to reach Guajiru Beach. We will continue our adventure by the seaside, by the sands of Mundaú Beach, then we will cross by ferry until Baleia, Caetano, Apiques and Icaraí da Amontoada beaches. We will go on through several small towns such as Itarema and Acaraú and, by secondary roads, we will reach Praia do Preá (beach). From there, by the seaside, we will come to Jericoacoara. 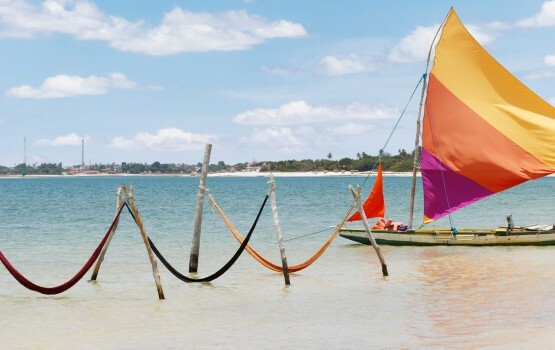 Throughout this coastal stretch of blue sea, the dunes and coconut trees will guide us through small fishing colonies interspersed with beaches and sophisticated luxury houses, in a breathtaking landscape which is typical of Ceará’s coast. This day may undergo change in route and stop duration for photos, bath and lunch due to the tide. The overnight stay in Jericoacoara will allow us to taste the nightlife of the small town, its restaurants, shops and bars. Note: On this day tours may be modified in order and route due to natural conditions. After breakfast, we will go by the seaside from Jericoacoara to Parnaíba. Our first cross by ferry will be at Guriú Beach, with its green-water channel and the cemetery of the mangrove trees. The 4×4 will follow the waterfront until Tatajuba Beach. Panoramic tour by the Dune of Funil. In the Torta Lagoon we will be delighted with the small hammocks over the water and the fruits of the sea curious “live” menu from Didi’s restaurant. Going on by the waterfront, we will reach the white dunes and Ilha do Amor carnaubas palm trees and we will cross by ferry the Coreaú Mouth until Camocim. About 130 km later we will be in Parnaíba where we will have lunch. We will go then to the In the Porto de Tatus where we will go by speedboat through the Delta do Parnaíba’s majestic labyrinth of islands. We will make a short stop for photos in the dunes of Ilha Grande de Santa Izabel. We will explore the Igarapé dos Periquitos, following its narrow channel flanked by several mangrove vegetation. In this stream there will be the crab caranguejo-uçá pick, where the pilot-guide stick in the mud of the swamp bringing the famous land crab, local delicacy.. We will walk through the Igarapé dos Poldros, which divides the islands of the Poldros and the Canaries. In this strem it is common sightings of animals such as monkeys, alligators, iguanas and birds beyond number! 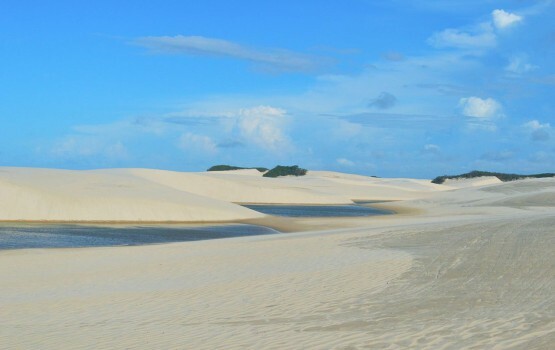 The landing in the chain of dunes Feijão Bravo reveals a rare phenomenon in the world and in which the delta is lavish. On one side we see a river beach and the other a beautiful ocean beach, bathed by the majestic Atlantic! The mangrove forest and ponds (in flood) complete the picture. Back to the port and overnight in Parnaíba, beautiful town with good structure of bars, restaurants and night clubs. After breakfast, on board of our powerful 4×4 (optional: Delta Cruiser tour – crossing Tatus-Tutóia), will do the 110 km of asphalt until Tutóia, crossing the Piauí and Maranhão border, where we will cross the Ponte do Jandira (Bridge) over the Parnaíba River. Its 640 m allow travelers to take nice photos! In the small hamlet of Comum, already at Tutóia, we will take secondary roads that will carry us to Lagoinha and, from there, until Paulino Neves and its streets displaying their white sand and its wooden bridge over the Rio Novo.We will make a short stop for photos at the Oasis of the Rio Novo (New River), the beginning of Pequenos Lençóis. Desert beaches, fields and dunes make up the landscape in this stretch. Arrival at the small town of Caburé and its rustic inns and restaurants, where we will have lunch (not included) and stay for the night. At noon it is possible to do a speedboat ride (not included) until the dormitory of the birds. After breakfast, and with all bags packed, we will go on speedboat by the Rio Preguiças until Barreirinhas. We will stop at the Mandacaru’s lighthouse, in the village of the same name, which on top of its eight floors will reveal a 360 degrees view of all the exuberance of the place. We will follow by speedboat until Vassouras, one of many points where the dunes of the Rio Preguiças meet the Pequenos Lençóis. Monkeys (“macacos pregos”) and parrots amaze the travelers who stop to refresh themselves with cold drinks served at the shadows of the tents. Our adventure will continue by the Rio Preguiças. On the way, palms and mangroves are home to birds, reptiles and mammals. 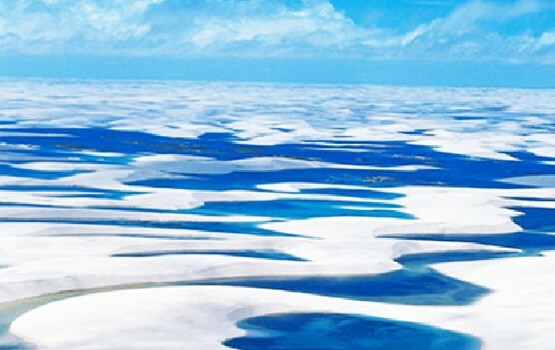 After check in and lunch (not included), walk to the impressive Lençóis Maranhenses National Park. On board of 4×4 we will cross by ferry the Rio Preguiças and will take the sand trails for about 40 minutes until the Azul and Peixes lagoons and their incredible and transparent waters. After a five minute walk through the dunes we arrive at the famous Lagoa Azul, an irresistible invitation to dive. For those who want to explore the spectacular greatness of the Lençóis, the 20 minute walk until the beautiful Lagoa dos Peixes is worth. Before we come back to the pousada, we will admire the sunset on the Lençóis Maranhenses, one of the most remarkable experiences that nature can give us. Breakfast. This free day (check out at the pousadas must be done until 12h00) will allow travelers to discover more about Brazil’s Northeast culture as they visit the Casa de Farinha (Manioc Mill), Marcelino’s community workmanship or going deeper in the discoveries of natural beauties of the region such as the Bonita Lagoon as well as the delicious floating on the limpid Rio Cardosa waters. These are optional walks and are not included in the itinerary. At the end of the afternoon we will embark on the minibuses towards São Luís. This trip duration is about 3h30. 1 night in Natal, 1 night in São Miguel do Gostoso, 1 night in Galinhos, 1 night in Canoa Quebrada, 1 night in Fortaleza, 2 nights in Jericoacoara, 1 night in Parnaíba, 1 night in Caburé, 1 night in Barreirinhas. Between destinations: Transferts Natal/São Miguel do Gostoso (private), São Miguel do Gostoso/ Galinhos (private), Galinhos/Canoa Quebrada (private), Canoa Quebrada/Fortaleza (private), Fortaleza/Jericoacoara (private), Jericoacoara/Parnaíba (privative), Parnaíba/Caburé (private), Caburé/Barrerinhas (private), Barreirinhas/São Luís (regular). Coast of Rio Grande do Norte: Genipabu, Maracajaú, São Miguel do Gostoso, Marco and Ponta do Mel (may change in order and itinerary according to natural conditions). Coast of Ceará: off-road panoramic tour by Ponta Grossa, Icapuí, Canoa Quebrada, Praia das Fontes, Morro Branco, Caponga, Barro Preto, Iguape, Prainha and Porto das Dunas (Beach Park) beaches – may change in order and itinerary according to natural conditions. 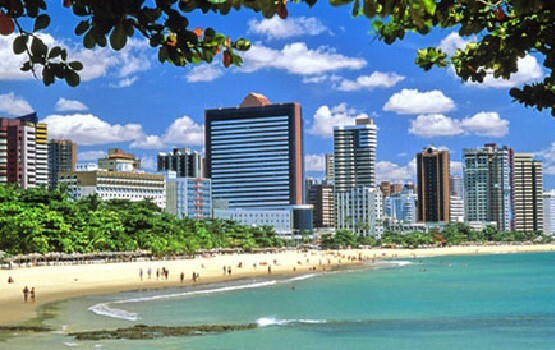 Fortaleza: Arrival and departure transfer (regular). Jericoacoara: off-road tours by lagoons Paraíso and Coração, Pedra Furada, Lagoa de Tatajuba (Lagoa da Torta) and Funil Dune (private). Parnaíba: tour by speedboat throughout the Delta do Parnaíba (Feijão Bravo Bay) (private). Barreirinhas: Tour by 4×4 to the lagoons Lagoa Azul and Peixes (regular), tour by speedboat by the Rio Preguiças with visit to Vassouras, Mandacaru Lighthouse and Caburé (private).